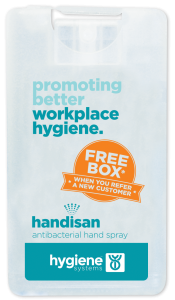 To receive your free box of 12 handisan antibacterial hand sprays (valued at $38) all you have to do is let us know about a potential new customer. Leave your details and theirs in the form opposite and we’ll get our friendly Sales Team to call them. If we secure an appointment we’ll email you to arrange sending your free box of sanitisers. There’s no limit on a number of new customers you can recommend. You’ll receive a box for every new customer that signs up.